Go See Joe at Sheridan Ford this February! Save more on a 2018 Ford Escape and 2018 Ford Explorer. 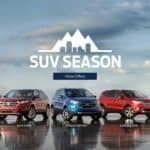 We are offering $7,000 off the original MSRP of both the 2018 Escape and 2018 Explorer. This offer expires 2/28/2019. Visit Sheridan Ford to take advantage of this deal! Join Sheridan Ford Sunday October 7, 2018 for the Fall Mustang Show! This is the First State and Ford Club’s 35th annual Fall show. Show off your Mustang and come see others! All owners of Ford Mustangs from 1965 on are invited to register. The show starts at 10:00 a.m. and ends at 3:00 p.m….